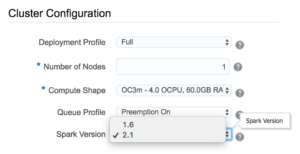 If you are new to Spark, and do not know which version of Spark you should pick, I recommend you to pick the highest available version (2.1). 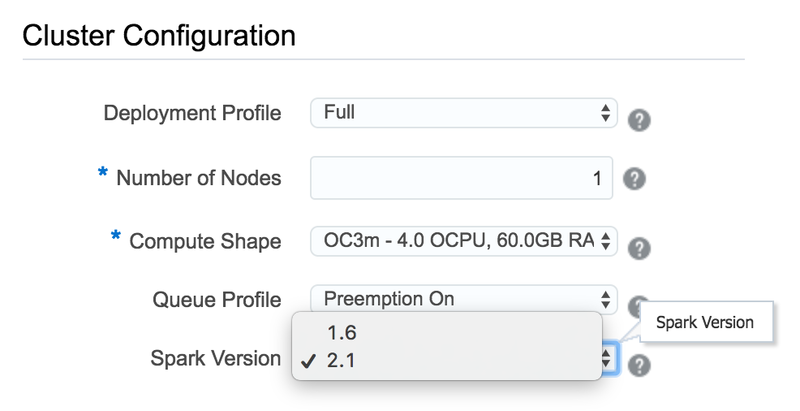 Don’t worry about stability because only the stable versions are available on Oracle Big Data Cloud Service. Spark 2.1 comes with performance improvements, support for structured streaming and ANSI SQL 2003. There are also changes on APIs for improving usability. On the other hand, if you have already scripts designed to run Spark 1.6, you better read the migration guide before selecting Spark 2.1. Zeppelin 0.7 comes with lots of improvements including support for Spark 2.1. It doesn’t have HIVE interpreter (which I used my previous blog posts). Instead of hive interpreter, we need to use “jdbc” interpreter. I’ll also write a blog post about it this week.